Pete Docter may be my favorite of the Pixar directors. He helmed some of my favorite of the studio’s stable: Monsters, Inc., Up, and Inside Out. Watching Monsters, Inc., I am reminded how much worldbuilding it requires, right from the jump. I would argue that it remains one of Pixar’s most imaginative movies to date. It does not take place in our world – let alone a bedroom or sunny backyard – but rather delves into a parallel dimension, populated by wildly outlandish characters. The characters dip into our world frequently, but the landscape virtually encompasses the entire globe. That is an immense undertaking, and a huge risk. That said, Pixar’s success with its first three films laid the groundwork for them being able to present something so “out-there,” and, thus, continue with even more radical ideas in the future. After all, Pixar was launched on a wild, unprecedented venture, so it’s not exactly surprising. Even though A Bug’s Life is the second movie in the Pixar filmography, this is my first post for “Watch-It Wednesdays,” my weekly movie night with friends. Going into this film, I remembered it fondly. I never did see it in cinemas, even though I had loved the trailer (still do, this one too). However, I was put off by public reception and by my own rather less than fond reaction to Dreamworks’ ANTZ. I will try not to compare the two films in this review as they really aren’t anything alike (aside from featuring insect characters) and they offer radically different viewing experiences. To this day, though, I prefer A Bug’s Life. Back in 1998, I remember a general consensus of disappointment with this film as a follow-up to Pixar’s first feature, but I find that, the further away we get from initial release, the better A Bug’s Life holds up. For the past several years, a highlight of my week is what my friends and I call “Watch-It Wednesdays.” The name has changed a few times (i.e. “Marathon Mondays”) but the idea has stayed the same; myself and a group of friends gather together to watch a movie (or a couple episodes of a television series). Considering how busy our lives get, this weekly staple provides a chance to stay connected with friends and partake in some good old-fashioned fun. Call it an exercise in self-care. This also has brought some remarkable new titles into my life; most recently, the anime film, your name. Though I’m super late to that bandwagon, I’ll probably have to write a post about that pretty soon. It was well worth the hype! In any event, I’m going to start blogging about the films we watch each week. We’ve gone through quite a few themes and collections (Doctor Who, Veronica Mars, Avatar: The Last Airbender, Firefly…) but now we’re beginning the journey through the films of Pixar Animation Studios, moving chronologically. So, last week we began with Toy Story and this week we watched A Bug’s Life. In both cases, it’s remarkable how well the story, characters, and animation hold up…and I shall elaborate in the separate reviews to come. First up: A Bug’s Life! In addition to publishing Resistance Rising, I’m approaching my two-year anniversary with DUO Media Productions and Star Wipe Films and I wanted to showcase some of the great work we’ve been producing, and of which I get to contribute. It really is a blast to work with such a fantastic team. I am far from a Shakespeare aficionado, and I’ve never been an especially big fan of poetry, but I’ve always been captivated by the Bard’s stories. I enjoy the scholarly challenge of reading Shakespeare’s plays, but I really love seeing them performed live. As such, one of the most enjoyable experiences I’ve had was the privilege of going to see Shakespeare Live with H.L. Shepler when it screened in theatres over the summer. It was absolutely marvelous. It’s screening tonight on PBS and I am so excited to see it again! If you have even a slight interest or curiosity in the Bard, don’t miss Shakespeare Live. Great performances, indeed. Not to mention hosted by two of my favorite people, David Tennant and Catherine Tate. If you can’t watch it when it airs, you can watch episodes of PBS programs at pbs.org/video. Update the first on my Inkshares crowdfunding adventure! 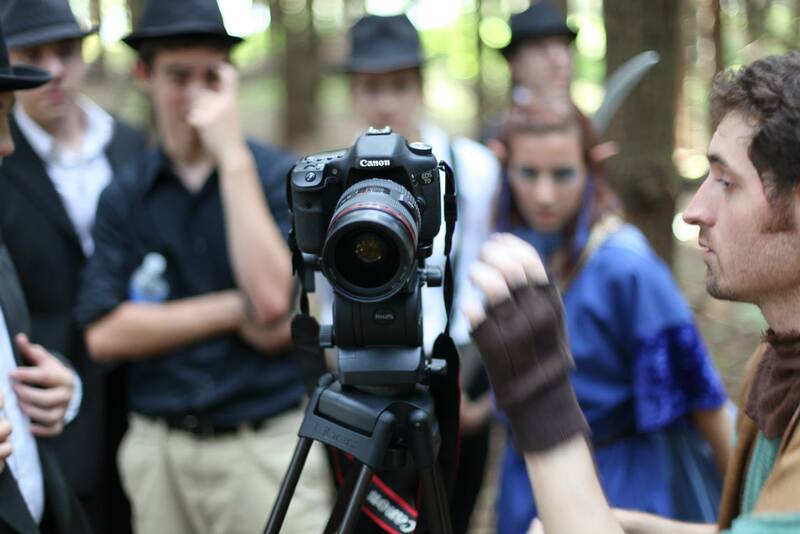 Genre Wars production still; Mobsters v. Fantasarians. 2013. More chapters will be posted on the Resistance Rising project page soon, but, in the meantime, I wanted to share a special update. Last week, I sat down with writer and book reviewer Barbara Brutt to shed some further insight on the novel: what it’s all really about (plot, characters, themes) and what makes it special, why I’ve chosen to crowd-fund through Inkshares and the evolution of the Genre Wars story from online filmmaking contest to indie web series and, now, to novel. If you’re still on the fence about this book, then I hope that this interview will help convince to make that pre-order! If you’ve already pre-ordered, you can still help by leaving a review. 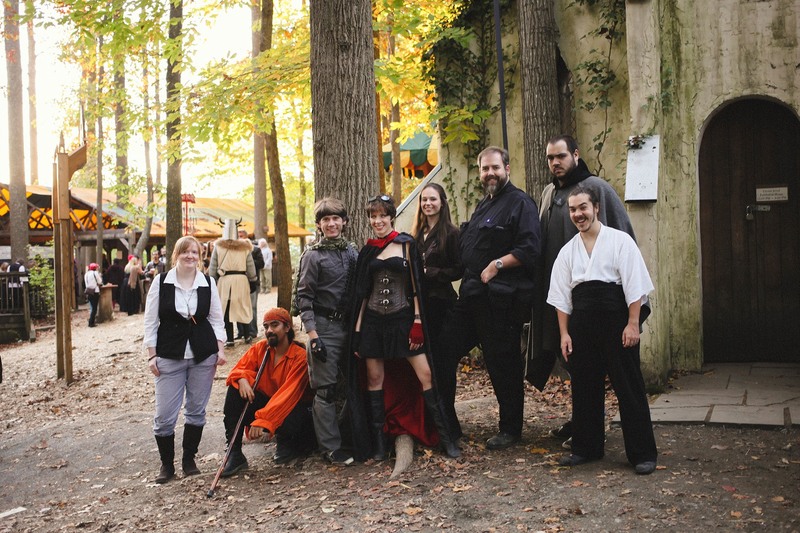 The Genre Wars team at the Maryland Renaissance Festival, 2014. ***Photos taken by Jenna M. Miller Photography. I recently wrote up a piece on Awesome Con 2016 as part of the DUO Media Productions blog. My first convention was Baltimore Comic Con in September of 2013. I knew about cosplay and I marveled (no pun intended) at the skill and detail some folks put into their work. I have always been very at home in Geek Culture, but privately and had never seen that world up close. It always seemed somehow out of reach; as a textbook introvert, I couldn’t see how I would be able to participate, but in my experience (both in costume and civvies) there is room for everyone. Two Disney Ladies; Rey and Steampunk Ariel.